RIO DE JANEIRO, BRAZIL – Opened on January 30th, the art exhibition “Frida Kahlo – Conexões entre Mulheres Surrealistas no México” (Frida Kahlo – Connections between Women Surrealists in Mexico) will remain on display in Rio de Janeiro’s Caixa Cultural through March 27th. Frida Kahlo’s 1933 work, “Autorretrato con collar” is part of the current Frida Kahlo – Conexões entre Mulheres Surrealistas no México exhibition, image courtesy of Caixa Cultural. The artist Frida Kahlo was born on July 6, 1907, in Coyocoán, Mexico City, Mexico. Many consider her one of Mexico’s greatest artists, who also became politically active and married fellow communist artist Diego Rivera in 1929. Her paintings were exhibited in Paris and Mexico before her death in 1954. 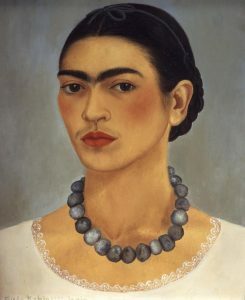 In addition to thirty works by Kahlo, the exhibition includes approximately one hundred works by fourteen other Mexican female artists of note: María Izquierdo, Remedios Varo, Leonora Carrington, Rosa Rolanda, Lola Álvarez Bravo, Lucienne Bloch, Alice Rahon, Kati Horna, Bridget Tichenor, Jacqueline Lamba, Bona de Mandiargues, Cordélia Urueta, Olga Costa, and Sylvia Fein. The exhibition, which was originally conceived and coordinated by the Instituto Tomie Ohtake of São Paulo and curated by researcher Teresa Arcq, features twenty oil paintings on canvas by Kahlo and ten works on paper which include collages, drawings, and lithographs. Works by the additional fourteen artists include paintings, sculptures and photographs and documents. In addition to the works, Caixa Cultural Rio is screening six films about artists Alice Rahon, Rara Avis, Jacqueline Lamba, Leonora Carrington, Remedios Varo and Frida Kahlo in its Galeria 1 (Gallery 1) daily throughout the exhibition. When: January 30th through March 27th, Tuesdays through Sundays from 10AM to 9PM. Entrance: Free admission with appointments scheduled through website.